Now, I have heard bands sound incredible at gigs where the subsequent live release has sounded awful, and vice versa. The first thing I will say is it here it sounds fantastic. It is well produced. You can hear everything very clearly without any imbalance whatsoever. I won't pretend to know what Mr Petrozza is saying when he addresses the crowd, (cos it's in German, duh) but whatever it is they love him for it. Importantly here, is the fact that everything is clearly distinguishable because it can be so easy -particularly for thrash metal bands, especially when recorded live - to sound, frankly, awful with lots of feedback, buzzing and crash symbols that overpower everything else. Not here. This has everything you'd expect from a thrash album - fast pace, killer riffs, roaring solos and lots of snapping lyrics about death, hate and killing, though nobody will actually die. But, very refreshingly, it has much more than I have come to expect from most LIVE thrash albums. It's ALWAYS so clear throughout, and captured with a live crowd so very well here. It doesn't just stop with the sound. It is surprising to think it lasts almost 2 hours because it really didn't feel like that to me. I've listened to it 4 times at the time of this review and to be honest every time I have always played back 'Phobia' and 'Hordes Of Chaos' several times. Happily those two songs are one after the other. STILL It feels less than half as long as it is. That's another feeling that a very clever producer has managed to transfer to a recording -a feeling that is so authentic about a thrash gig. I mean, when you're there and the band is really good and the adrenaline is pumping, how often does 2 hours actually feel like 2 hours? Not at all often is the answer. Even more rare is when that feeling comes across from listening to an album - for me at least. We are supposed to find fault in even the things we think are best, and I appreciate that I am the rookie new guy of The Power Of Metal crew, but to be honest I cannot fault this album. It is simply the best live thrash metal album I have ever heard. I am aware there are likely many I haven't heard but that shouldn't take anything away from this. Normally I may be apprehensive of a band that keeps things at the same pace throughout an album, which can become a little tiresome. 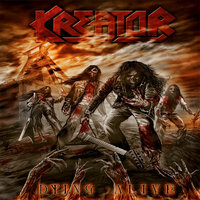 With the brief exception of some intros to songs like When the Sun Burns Red and Amok Run, among others, Kreator have filled this album with songs that keep the speed at lightening pace. Be honest though, isn't that what we WANT from a thrash metal album? It damn well is for me. Sure, there are other bands that have done this, there are also others that are more technically proficient in places than Kreator may be - but there has not been a live album I personally have heard that captures the essence of a thrash metal gig as aptly as this does. Why? Because it does something that albums rarely do for me anymore - it makes me imagine being there. I almost never say that, because a live recording simply feels a million miles away from actually having been to the show most of the time. Sure - I wasn't there, but I think this invokes the closest feeling I have ever had to being at a gig where I wasn't personally present. There is a blue ray and DVD of this too, you lucky people! I can't imagine the effect that will have on me, but I will be finding out soon. Dying Alive is certainly a must for any thrash metal fan and people with even an occasional, fleeting interest in the genre also really should give this a go. Outstanding.